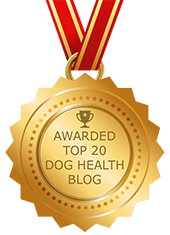 Putting The Easy Back Into Walking | Dawg Business: It's Your Dog's Health! Cookie's transition to civilization includes learning how to walk on the leash. She doesn't quite understand that flying in the air at the end of it does not qualify. The very first thing we did was the exchange her collar for a harness, to keep he neck safe. We fit her in Jasmine's shoulder harness the first day we got Cookie. 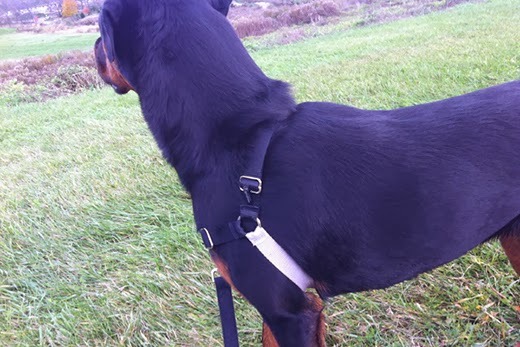 Shoulder harness does it's job to protect the neck but doesn't do anything for walking nicely on the leash. While we keep working on Cookie's training, there is nothing with cheating a little bit and getting some extra help. I looked at all the products they have for there very thoroughly. I don't feel comfortable with any of the halti type of products, for the same reason we immediately stopped using the collar. I didn't feel it was safe for the neck. Jasmine's chiropractor does not like these products for the same reason. And she would know, wouldn't she? 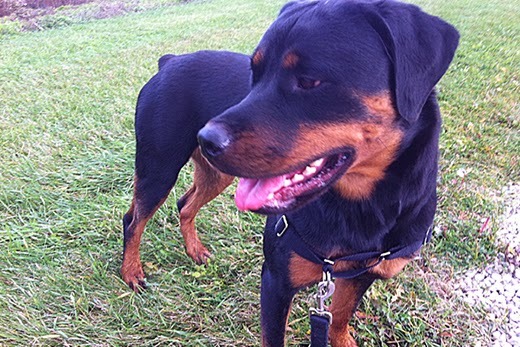 Plus one of the Rottie's we were considering for adoption was fitted with one and it didn't make a lick of a difference in her pulling power as far as I could tell. There is one such product Jasmine's chiropractor likes and recommends, because it works differently. 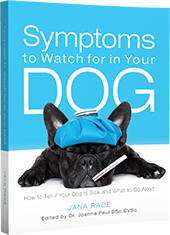 When pressure is applied, it pulls the dog's head downward, toward their chest. We tried it for JD. It works very well, except a) JD hates it and b) it keeps falling off the nose when he does walk nicely. Then there is the question how well it would stand up to a squirrel sighting. Then there is a range of no-pull harnesses, most of which hook up at the chest. Paranoid as I am, I was concerned that this might pose a potential injury threat too, if the dog gets turned around too violently. Because Cookie's shoulder harness did have a ring at the front, at the advise of my dog trainer friend, I tried hooking up the leash there to see what would happen. It did, indeed, make the walk easier on me. So it seemed that the idea is working. But because that harness wasn't really meant to be used this way, I felt that trying out one that is actually designed to be hooked at the front might bring better results. I decided to try the Easy Walk Harness. I have to say that it does put the easy back into walking. For some reason, Cookie seems to be aware of it and it diminishes her attempts to pull. (Not sure how exactly that bit works, but, somehow, it does). Combined with some training work, I think this is the right idea. Not that it stops Cookie from trying to leap after a squirrel. But even then, the overall pull I have to contend with seems less, somehow and my shoulders can remain in their sockets. There are couple things about it I'm not completely pleased with, such as the way the leash is flailing about when Cookie IS walking nicely. This doesn't happen when she's in the heel position and I hold the leash just right but when I let her loose a bit to sniff things the leash gets a life on its own. I'm also not completely happy with the way it fits the body. I feel it must be annoying as hell but Cookie doesn't really seem to mind. Overall, I think this is a great tool and it certainly helps make the leash walks more pleasant, at least for me. It also makes the training work easier. It is easy to put on once adjusted to the right size. That bit, at least with Cookie, did require two people. Disclaimer: I did not get compensated or asked to review this product. We had an easy walk harness for Blue and it was amazing. It did a great job of making our walks a little more controlled. Good to hear. It does help, doesn't it? Thanks for this review - I've just decided to get read of my regular neck collars - Maggie pulls a bit too much and I just don't like it, so I think I'll give this a try. There might be brands that are better than this one. But the concept is certainly great, whichever brand harness you get. I also hear good things about the Freedom no-pull harness. Is the Easy Walk the one the chiropractor recommended? Yeah, I heard good things about that one too. Great review. Thankfully, our dogs don't pull. I have always wondered how these would work on big dogs. I just don't feel like I would have enough control over a big dog like Leroy if he decided he wanted to chase something. We use EasyWalks on our big dogs. On Mia, for some reason, her leash spins around on it, and the clip sort of bounces off her chest. (probably a leash design problem), so Rob prefers walking her with a step through harness that clips on the back. With the clip on the back, she pulls more than I like to see, but not enough to be a huge problem. Leo does really well on the EasyWalk. It fits him better than the step-through, and he doesn't pull. Our first dog, Isis, was the worst puller ever. We attached a two-ended leash to a Halti on one end and a step-through harness at the other, and guided her like a horse. Yeah, some just know how to pull, don't they? I still remember daughter's Chi, she was side-ways, that's how hard she was pulling. It was amazing how much power she exerted for her size. Sounds similar to the ThunderLeash idea. We did try that one on JD. It's not bad, but he doesn't like it and it doesn't work all that well. Cookie doesn't mind the Easy Walk Harness at all. So that's a good start. The EasyWalk was a miracle when Kolchak was a puppy and I sang it's praises. Then, Lu joined the family and we tried it with him: DISASTER. If yours didn't come with one, I STRONGLY recommend getting a coupler to link it to her collar, just in case. The harness still carries the weight of any pulling, but if she twists just right and manages to get free (like Lu did all the darn time) then you still have that coupler to the collar. I learned the hard way. It's a great tool, just not as fool proof as I thought. Thank you for the pointer. Cookie didn't show any tendency to get herself out of the harness, but it's certainly something to be aware of! No, ours doesn't have a coupler.